Our product range from Gulf Craft offers the very best in value for money. With over 32 years experience in boat building, we provide a vast range of products which are very well suited to the region. Our range consists of cabin cruisers and open day boats each provided with a head, and ample seating and plenty of the most important aspect, plenty of shade!! Each vessel comes with Suzuki 4 stroke power or Volvo Penta Diesels as standard, and economy has never been better with this combination. Air conditioning is available on many models and many other factory and custom options and upgrades. “Silvercraft” is a Brand of Gulf Craft. The Oryx Series from Gulf Craft, offers modern styling and exceptional sea keeping qualities, hidden behind a seriously competitive price tag. Starting with the latest model to the Oryx range the new ORYX 27. Launched back in March 2014 this model is already proving that it is a perfect starting point to boating. The Oryx 36 can be seen cruising the waters around Phuket, and there owners are enjoying long weekends on the boat, enjoying the two full sized cabins in air conditioned comfort. The Oryx 42 is an exceptional vessel with high quality interiors and a large cockpit and deck area. Her Triple 300hp outboard motors cruise easily at 28 knots and 4200rpm meaning fuel economy is very good, or for an exciting turn of speed she will achieve 43 Knots using the same engine package. With outboard power these two sports cruisers can get right up close to the beaches and allow shallow water anchoring. Boat boats are available either with Outboard and inboard power options. “Oryx” is a brand of Gulf Craft. “Utility series” 36, 40 and 56ft and 31 and 36 Patrol. The Touring series from Gulfcraft offers the safest water transport platform available. The Touring 36 can be seen in their hundreds safely transporting passengers in the Maldives, India, Malaysia, Philippines and Thailand. With exceptional sea keeping abilities and great value for money these two vessels have been the factories best seller of all time. A larger version the Touring 40 is available for those wishing to carry greater numbers of passengers. With custom floor plan and seating layouts, these two boats can be built to each operator’s individual personal specs. A new Model launched in 2014 the Wave Shuttle 56 can accommodate as many as 50 passengers in air conditioned comfort, and with inboard diesel power and plenty of fuel on board this model can cruise for endless hrs to dive sites or from port to port. For the governmental departments the 31 and 36HT Patrol boats are available to provide a reassuring presence to provide safety and recovery support and border protection. The “Utility Series” is a Brand of Gulf Craft. Nomad Yachts is Gulf Craft‘s brand name for an exciting new range of cruisers. Created for the serious boater, they reflect the growing interest in the worldwide market for a craft that can offer long range cruising, along with the luxury and comfort of a mini superyacht. The Nomad Yachts range consists of the 65, 75, and the 95. 48. 56. 63. 70. 77. 88. 101. 105. 122. 125. 135. 155ft. The impressive Majesty Series offer value for money coupled with high quality build construction techniques. All Majesty yachts being build in the United Arab Emirates come with tropical specs as standard. From quality gel coats and interior wood finishes and high capacity air conditioning systems means that you stay cool in the Asian summer heat and you investment stays looking new for many years. With many interior customs options and power choices, our range beats the others hands down on luxury and value for money. Deals you can’t afford to miss. Price and viewing on application. 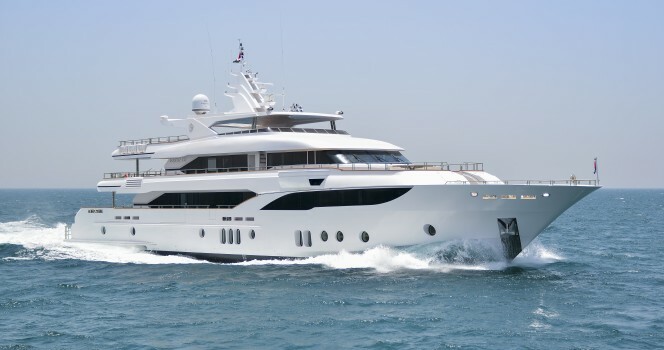 “ Majesty Yachts” is a brand of Gulf Craft.